To know more about the Article, click here. Did you know that your thinking directly affects how you feel and the decisions that you make? It’s true. When you are feeling depressed, sad or angry, you are more likely to make a bad decision. On the other hand, when you spend time with God, seek His wisdom and align your feelings with His Word, your choices will have a more favorable outcome. Too often, people make bad decisions because they are acting out on their emotions rather than remaining focused on the will and Word of God. The key to getting control over your emotions is straightening out your thought life and recognizing that negative emotions stem from wrong thoughts that you have accepted into your mind. Emotions are feelings on the inside trying to move you in a particular direction. When your thought life is full of doubt, fear and unbelief, your emotions will reflect your mindset and influence your decisions in the wrong direction. Negative emotions will cause you to feel powerless, but you don’t have to be held captive by bad feelings. The Word says to think on those things that are honest, lovely and of good report (Philippians 4:8). Being a guardian over your thoughts is essential to keeping your emotions in line with the Word. By meditating on what the Bible has to say about your life, you fill your mind and heart with the thoughts of God, and can root out negative emotions. A mind that is in agreement with God will actually produce positive emotions that will keep you in His will for your life. Peace and security can be your reality every day rather than uncertainty and discontent if you train yourself to think positively by using the Scriptures for meditation. When Jesus comes into your life, He changes your heart to desire a life of abundance. The Word says to guard your heart with all diligence because the issues of your life flow out of it. Whatever you allow into your spirit will end up overwhelming and overtaking your life. If you let negative emotions take root in your heart, the result will be a negative life because these emotions will lead you away from the will of God and the destiny He has for you. You may feel that your circumstances are beyond your control, but don’t allow what things look like in the natural to make you feel depressed or anxious. Satan will try to sabotage your decisions by getting you to receive his negative thoughts and suggestions. Don’t let him do that! Go to God and let Him transform your thinking. Begin speaking positive, affirming words that will bolster your faith, and think about how much your Father loves you. Be conscious of your decisions and why you are making them. Don’t allow fear and unbelief to enter your mind. Guard your heart by confessing scriptures that support God’s image of you and His plan for your life. Maintain an attitude of expectancy. Put on the garment of praise and expect God to do everything you’ve asked and more (Ephesians 3:20)! Fear is the reciprocal of faith. Just as faith opens the door for you to receive blessings from God, fear enables the works of the devil to wreak havoc in your life. Simply put, faith connects you to the promises of God, while fear connects you to the things you fear. There have been reports of people who were so afraid of dying in a plane crash, for example, that they actually died that way. And it was no coincidence. Their fear of death connected them to the accident. The same is true of people who are afraid of contracting cancer or some other terminal illness. Their fear of sickness is stronger than their faith in healing, and they ultimately contract and die from whatever disease they feared. Romans 10:17 says, “So then faith cometh by hearing, and hearing by the word of God.” Likewise, fear comes by hearing, and hearing the words of Satan. When dealing with fear, you need to realize that Satan uses the things found in the natural realm against you. He tries to convince you that the things you can see and hear are more real than the truth of God’s Word. When you depend solely on what you can see and hear rather than on what God has said, you leave yourself open to deception. Several years ago, I was involved in a near-fatal accident. Although I walked away unharmed, I was so afraid of injury and death after the accident that I became overly cautious when driving and I constantly worried about the safety of my family. If I had continued down that path, the things that I feared would surely have come to pass in my life. That’s exactly what happened to Job. His fear connected him and his family to tragedy (Job 3:25-26). After I realized that I had given Satan access into my life, I confronted my fears. By doing that, the Holy Spirit revealed to me that all fear is born out of concern for self. Fear is rooted in selfishness. Therefore, to weed out fear, I first had to deal with selfishness. I challenged myself to locate and eliminate selfishness in every area of my life. In these last days, there will be plenty of opportunities for you to walk in fear. In fact, Luke 21:26 says that men’s hearts will fail them because of fear. But Believers can live fearlessly in these perilous times. Regardless of what may be happening around you, don’t allow fear to come into your life. God has not given you a spirit of fear, but of power, love and a sound mind (2 Timothy 1:7). You have nothing to fear! Make a decision today not to tolerate fear on any level. When problems occur in your life, do you ever question God and ask “why?” For example, “Why is this happening to me?” or “Why do I have to go through this?” Even the most devoted Christian has asked these questions at some point in his or her walk with God. These moments of doubt have happened to all of us, but rather than worry or fall into the trap of questioning God when challenges come, see troublesome times as opportunities to develop a closer relationship with the Father. A Believer has the answer to every challenge or problem he or she may face in life—the Word of God. It is your source of comfort and strength during the storms of life. However, allowing your emotions and frustrations to override your faith and trust in God creates a sense of panic and gives way to a victim mentality. This will only keep you stuck in your situation. So how do you change your response to trouble? By making the Word of God your final authority and understanding that God is your only source for strength and victory. Recognize that no problem is greater than His power to overcome it. When you meditate on God’s Word and accept that challenging times will come, the Word will create in you a foundation by which to build your trust in God. This increases your ability to be unmovable by the enemy’s attacks. Having a positive attitude when confronted with negative situations makes all the difference in the world. Even though this is easier said than done, stay positive and continue communicating with God daily through prayer, praise, worship and the studying of His Word. Don’t question His love for you, but stay focused on His promises. Your efforts to trust God rather than question Him will go a long way. By demonstrating your faith through continually confessing the Word over your situation and believing with your heart, you will begin to see His power work in your life. Remember that God isn’t a respecter of persons, but He is a respecter of faith (Acts 10:34). Don’t give in to your problems; God’s Word has prepared you for all the trials and temptations you will face. As you grow in your walk with the Lord, your trust in Him will develop as well. Don’t condemn yourself if at first it seems hard to trust Him. God understands the struggles that Believers face but He has also given you His Word, which is the only resource you need to be victorious over any circumstance you face. Use every opportunity to build your faith in God’s love for you and His ability to bring you out. Instead of breaking down, blaming God and asking, “Why?” be confident in Him and know that He is working out every detail of your life. 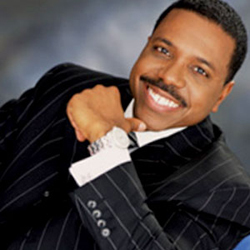 Creflo Dollar: Who Is the Holy Spirit? The subject of the Holy Spirit is one of the most misunderstood and misinterpreted subjects among Christians and non–Christians. Many people are afraid to hear sermons about the Holy Spirit because of incorrect teachings they may have received in the past. The topic of speaking in tongues and the gifts of the Spirit are often shunned as a result. However, the Holy Spirit is real. He desires to work through you so that you can experience the power that God ordained every Christian to have and use in these last days. Gaining an understanding of who the Holy Spirit is, and who He is not, is critical in order to experience His presence and power. The Holy Spirit is not a feeling or an emotion. Although His presence can stir up emotions within you, He actually is the third person of the Trinity God the Father, God the Son and God the Holy Spirit. When you receive Jesus Christ as your Lord and Savior, the Holy Spirit comes to live in your heart; it becomes His dwelling place. As you learn to yield to Him, you will find yourself walking out God’s plan for your life. In addition, you will experience supernatural power and breakthrough like never before. Jesus explains the function of the Holy Spirit in John 16:7, “Nevertheless I tell you the truth: It is expedient for you that I go away: for if I go not away, the Comforter will not come unto you; but if I depart, I will send him unto you.” Jesus knew He would have to leave in order for the Holy Spirit to come to the earth. Now that the Holy Spirit is here, and dwelling in every member of the body of Christ, the power of God can flow to an even greater extent than when Jesus walked the earth! The Holy Spirit is the motivator, energizer and operator of every revealed plan or vision from God. He is also the revealer of the hidden treasures of the Kingdom of God and holds the key to the inheritance of the saints. He is the most valuable asset to Christian living, and yet many times, Believers don’t know enough about Him to really take advantage of what He can do in their lives. Since we are living in the Last Days, it is going to be imperative that you know how to distinguish the Holy Spirit’s voice. That “hunch” or inner feeling you have inside that is either directing you or telling you not to do something is the Holy Spirit. You can develop a discernment of His voice through studying and meditating on the Word of God. He will never say anything to you that doesn’t line up with the written Word, so studying the Bible is essential to your recognizing His voice. Praying in tongues also helps to sharpen your spiritual discernment and awareness of Him. It may take some time to become proficient in recognizing His voice, but as you develop, pay attention to whether or not you have peace in your spirit about something you are about to do. If you don’t, most likely the Holy Spirit is warning you not to proceed. When you acknowledge the Holy Spirit and commune with Him on a daily basis, He will show you mysteries and the secret plans of God for your life. Jeremiah 33:3 says, “Call unto me, and I will answer thee, and show thee great and mighty things, which thou knowest not.” He will guide you into your destiny when you allow Him to direct your decisions. When you call on the Holy Spirit, you may say, “Holy Spirit, I don’t know what to do in this situation, but I know You know the answer. Show me what to do.” Spend some time praying in the Spirit and then wait on Him until you hear Him speak to you about it. When you call, He will answer. You can cultivate your relationship with the Holy Spirit by praising God, praying and singing spiritual songs (Ephesians 5:19). Doing these things helps to build your spirit and makes you more sensitive to His presence. Invite Him into every situation and atmosphere in which you find yourself. When you acknowledge Him this way, He will be able to move in your life. Since the Holy Spirit was sent to help guide and direct your life, it is important that you set aside time every day to fellowship with Him. Talk with Him as you would a close friend or family member. Let Him know your concerns and confess the Scriptures. He will give you the revelation, insight and enlightenment you need to lead you into the good life God has prepared for you. Developing a relationship with the Holy Spirit is going to cost you something. It will mean getting up to pray when you don’t feel like it and letting go of old habits and mindsets that oppose God’s Word. But when you create an environment in which the Holy Spirit can dwell, you will reap the rich rewards of your relationship with Him. Are you willing to pay the price? Have you ever told a lie, or exaggerated the truth? Or, do you engage in situational ethics in order to get ahead in life? Lying, exaggerating the truth and being less than forthright in your dealings with other people all have one thing in common: a lack of integrity. When you make a habit of not walking uprightly before the Lord, it will become a habit that will propel your life in the wrong direction. For this reason, it is critical that you develop a life of integrity so that you can reap all the benefits God has promised you in His Word. From telling the truth to being honest at work, integrity is a critical part of your walk with God. What does it mean to be a person of integrity? In simple terms, being a person of integrity means that you do what is right because it is right. It is demonstrating character. Living a life of integrity means being honest, trustworthy and reliable. It is who you are when no one is looking. A person of integrity represents the Kingdom of God in ways that demonstrate to the world the character, power and love of God. Your words determine whether you display the character of integrity. Words have power and what you say can impact others in a profound way. For example, when you tell a lie, you not only have the potential to deceive yourself, but you destroy trust and respect where other people are concerned. Being dishonest can cause a domino effect that can hurt you and damage your relationships with friends, family and coworkers. On the other hand, when you speak the truth in love and make sure that your words line up with the Word of God, you can create a positive outcome in life and fortify the character of integrity you are seeking to develop. Be mindful that you don’t allow deception to creep into your life unawares. The enemy will try everything he can to separate you from God. He does this by creating situations that challenge your faith and belief in God’s Word. He wants you to make decisions that go against what God has said and then convince you that sin isn’t so bad. However, Psalm 25:21 says, “Let integrity and uprightness preserve me; for I wait on thee.” I encourage you to stand on the Word when the temptation to sin comes. Doing so demonstrates integrity. Lying is not the only way that you deceive others and yourself. You can live a life of deception as well. Any time you do not purpose to live as God intended or according to His plan for your life, you demonstrate your lack of trust in Him and His Word. One responsibility that Christians have is to uphold God’s Word through their lifestyle. Don’t allow the world’s standards to govern your life. Don’t pretend to be something you’re not, but instead seek God’s purpose for your life and make His Word your final authority. Being truthful is a choice. Like any attribute of a Believer’s life, integrity can release blessings if you choose to live a life based on truth. When you indulge in dishonesty, there is a consequence. The Bible says, “The man of integrity walks securely, but he who takes crooked paths will be found out” (Proverbs 10:9, NIV). Decide today that you will avoid the crooked paths and live in the freedom that our Father promised. Overcoming the spirit of deception and deciding to be a person of integrity is one of many tests that you will face. I encourage you to seek God’s wisdom and meditate on His Word in an effort to grow and mature in your walk with Him. By applying the Word of God to your life, you can be a person of truth and integrity.